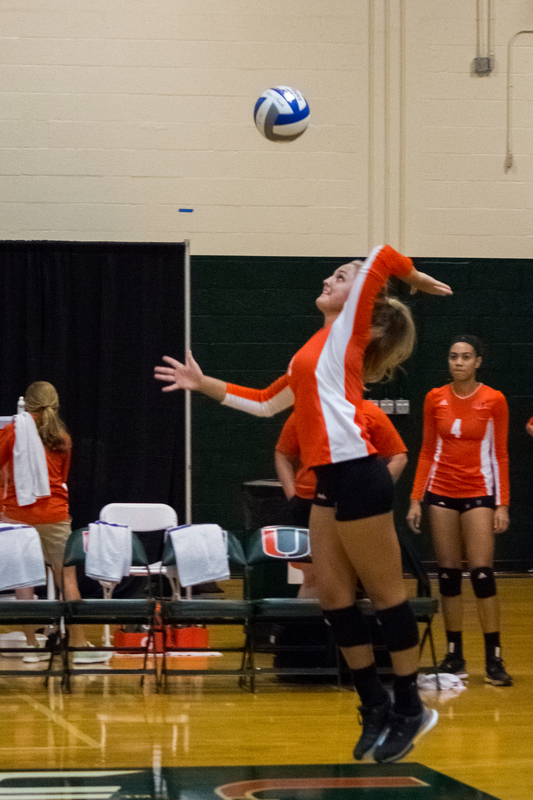 The Canes finished off the Hurricane Invitational in dramatic fashion Saturday night, beating Kansas State 15-10 in the fifth set to sweep the three-match kickoff event for the volleyball team at the Knight Sports Complex. Sophomores Olga Strantzali and Sakile Simmons united for a monstrous block to finish the match and solidify the Hurricanes’ undefeated status at the invitational after beating Illinois State and Florida A&M three sets to none on Friday night and Saturday afternoon. “Everything was flowing. There was a great environment and I think everything finally connected tonight,” said Kelsie Groot, a redshirt junior who finished the Kansas State match with 19 kills and had a team-high 24 for the weekend. Not only did Groot lead the team in kills, she was also third on the team for digs, first for attacks and third for hit percentage in the win over the Wildcats. “Kelsie’s solid. That’s the Kelsie we see every day in practice,” Coach Jose Gandara said of the outside hitter. Also leading the team in kills for the tournament was Strantzali with 23, and senior middle hitter Alexis Mourning with 18. Mourning was out last season with a lower leg injury, but is now fully healthy for her senior season. Strantzali, a left-handed hitter with a killer serve, transferred from UCLA for her sophomore season. The Greek native is already making an impression on her teammates; setter Haley Templeton described Strantzali as her “go-to” so far this season. Templeton, sophomore team captain, ended the invitational with 75 assists. “It felt great. Getting three wins right off the bat really takes off the pressure for all the new girls coming in,” said Templeton, the 2014 ACC Freshman of the Year and All-ACC Second Team member. The Canes will be back at it in Springfield, Missouri for the Missouri State Tournament on Sept. 4.